This is a sponsored post written by me on behalf of U.S. Civil Rights Trail. All opinions are 100% mine. “I already know the next stop is one you’re all waiting for, so I’ll tell you now that the second to last landing near the top of the Lincoln Memorial is the spot where Dr. Martin Luther King, Jr. gave his famous 'I Have Dream Speech.' "
Smiling, the tour bus driver glanced into his mirror as the riders gathered their bags and readied their cameras, clutching scarves and coats to preparing to step out into the icy Washington DC air. I peered out at the sea of photo takers who had already beat us to the iconic spot. On this Martin Luther King Day and nearing the 50th anniversary of his death, these visitors could have spent their day off anywhere in the world. But like me, they chose to be here. Unlike the crowded canals of Venice or tourist-heavy attractions of New York City, it stuck out to me that I didn’t overhear anyone complain about the selfie-takers or make other cliche remarks about too many tourists. Quite the opposite actually. The visitors from every corner of the world, speaking every dialect and language, helped each other ensure their photos were of the best quality. Fifty years later, just the residual energy and spirit of the words spoken in that very space has made instant collaborators out of strangers. Washington DC has always been one of the central and most symbolic cities in Civil Rights history. And it continues to be one of the most significant stops along the U.S. Civil Rights Trail. On 28 August 1963, some 250,000 people gathered in front of the Lincoln Memorial in Washington, D.C. The March on Washington, officially titled the March on Washington for Jobs and Freedom, was a protest help to draw attention to continuing challenges and inequalities faced by African Americans in an era of Jim Crow and segregation. The march was organized by the six of the biggest leaders of the civil rights movement: A. Philip Randolph, Whitney M. Young Jr., Martin Luther King Jr., James Farmer, Roy Wilkins and John Lewis. The purpose of the march was to advocate for civil and economic rights for African Americans. It was here, on the steps on the memorial, that Martin Luther King Jr. gave his now iconic, “I Have A Dream” speech. It then comes as no surprise that the March on Washington is one of the largest political rallies for human rights in American history and a catalyst for the Civil rights act of 1964. The most prominent figure in the struggle for civil rights, Martin Luther King Jr has become synonymous with eloquence and articulation in the face of injustice. Dr. King is the first African American to be honored in the National Mall. While it is said that all statues in the District should be shorter than the 19 1/2-foot Statue of Freedom, which stands on top of the Capitol, the MLK Memorial stands 30 feet high. 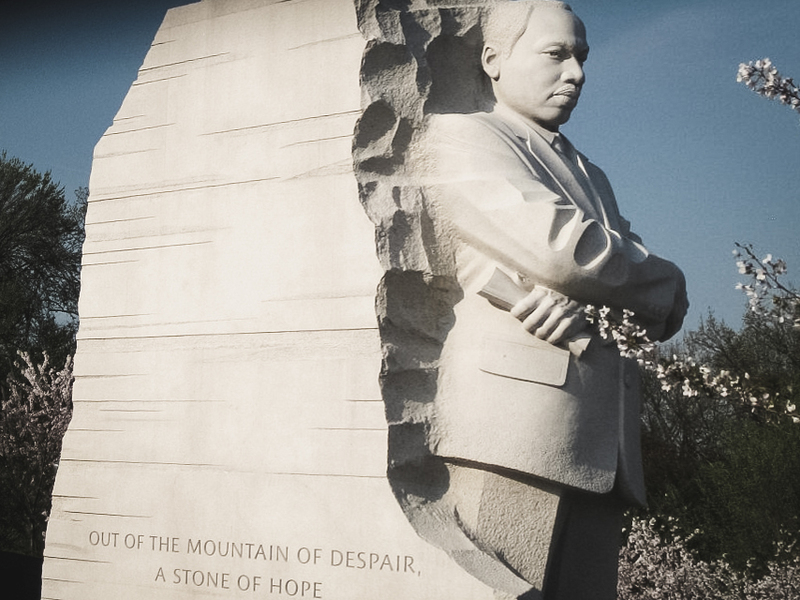 Dr. King’s likeness is carved into the Stone of Hope and represents the Mountain of Despair. On the side of Stone of Hope, the words “Out of the mountain of despair, a stone of hope,” a line from Dr. King’s “I Have a Dream” speech, is cut into the stone. All around the monument, a 450-foot inscription wall features 14 quotations from Dr. King's speeches, sermons, and writings. The quotes were selected by a council of historians. Among them Poet Laureate Maya Angelou. An interesting fact I learned: The famous DC cherry blossom trees are positioned to bloom in a particular spot so that Martin Luther King Jr. can be observed gazing upon them. The highest court in the land is the site of the some of the most significant and life-affirming judgments in the United States, including the landmark ruling in Brown v. Board of Education. The decision made segregation of public schools illegal effectively overturning separate but equal. It’s impossible to see the Supreme and not feel something. Although at the time I may not agree or understand rulings made within the chambers, I can appreciate the work and effort that goes into laws that will ultimately affect the way people will live their lives. It’s hard to imagine a world where things I’ve often taken for granted, like waking up and taking a bus to school, would be a right that African American still alive today had to fight for. Address: 1 First Street Northeast Hours: Monday – Friday (except Federal Holidays),9 a.m. – 4:30 p.m. Price: Free. The Supreme Court does not offer guided walking tours, but visitors are encouraged to tour public portions of the building on a self-guided basis. Court sessions are open to the public. Not far from the Supreme Court where Brown vs the Board of Education was decided, is another landmark in the integration of the public education system. John Philip Sousa Middle School (formerly Junior High) became the scene of a civil rights case when 12 black students were denied entry in the then all-white public school. Address: 3650 Ely Place Hours: not open to the public. Note: This landmark is a current public school. The National Museum of African American History and Culture Opened in September 2016, the Museum of African American History and Culture is the first and currently the only national museum completely dedicated to the experience of the African Americans. From Harriet Tubman, the Tuskegee Airman and Black Lives Matter, to Islam in early colonial America, the Harlem Renaissance and segregation and Jim Crow. You will learn about how violinist Ginger Smock blazed the trail for female musicians and how lynching became a tool of terror in the black community. The museum houses more than 36,000 artifacts and features exhibits on African and African-American culture and contributions to arts and music, the military, athletics and more. Unlike some of the artifacts found in some of the other Smithsonian museums, the objects and exhibits don’t feel so distant. And purposefully so. The displays here are from days not long ago. It was humbling and often times chilling to witness history and know that this isn’t from the imagination of a filmmaker or screenwriter as it often feels so removed from the screen. But rather the former lives of individuals that subjected to cruelty and unfairness. “Creating A Segregated Society” sheds light on how government upheld laws and “redlining” condemned African Americans to second-class citizens. In this space, you’ll find James Baldwin’s passport, Addeperle’s costume from the Wiz on Broadway and the Olympics credential badge for Gabby Douglas, as well as slave auction posters and Emmett Till’s casket. The sheer amount of information is overwhelming so I recommend taking a full day and not trying to schedule too many stops along the way. Address: 1400 Constitution Ave NW Hours: Open daily, 10:00 a.m. to 5:30 p.m Price: Free, but you must obtain a timed entry ticket here. Limited passes available each day. "What happened here changed the world." No matter what your destination this year, make some time to share in the extraordinary tales of perseverance in the face of racism, segregation, and illegal voting practices and stand for a moment in the footsteps of those that sacrificed life and limb in the pursuit of equality. Over 100 attractions across 14 states, these landmarks are full of gripping and soul-stirring history, aim to educate national and international travelers the regarding the dark, but significant period in recent American history. Careful and special emphasis has been given preserving these iconic landmarks and the role they played in the tapestry of the United States.